So you missed Nendoroid Spider-Man: Hero’s Edition when he was released last year? Well, you are in luck, as you will get another chance to snag him again this year. The web-slinging Nendoroid hero is being rereleased! The world-famous Spider-Man joined the Nendoroids as a fully posable figure wearing his newly designed outfit from ‘The Amazing Spider-Man’ – and due to popular demand he is being rerelased! His entire outfit has both the spiderweb texture and appearance that fans have come to love. Spider-Man also comes with a few optional extras, such as parts to display him shooting his web as well as a suction cup that attaches to the support prop for even more poses. He also comes with a special dioramic pedestal that allows you to display him swinging above the city, watching over the citizens of New York! 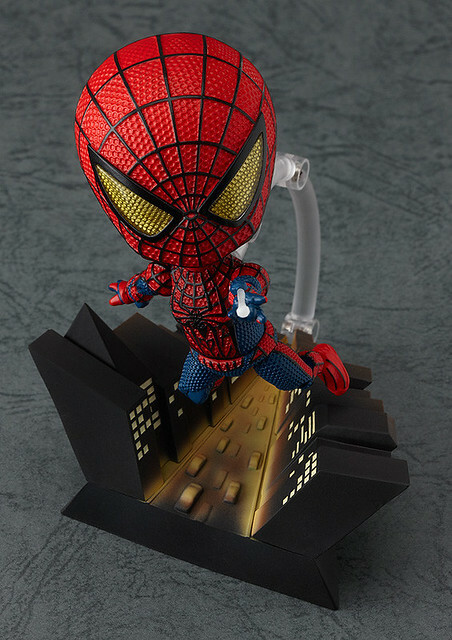 The re-release version of Nendoroid Spider-Man: Hero’s Edition is priced at 3909 Yen and scheduled for June 2014. This entry was posted in Uncategorized and tagged amazing spiderman, nendoroid, spiderman.